A shameless mum-of-two who knocked down a postman with her car before fleeing the scene has narrowly avoided a prison sentence. Sheree Fogarty was reprimanded by magistrates for her "lack of remorse" over the hit-and-run, which left Vince Marsh with life-changing injuries. She even failed to attend her own trial last month, but was found guilty in her absence. As she was sentenced this week, magistrates had to tell the 44-year-old to be quiet and stop talking in the dock. They heard she had struck Mr Marsh as he waited to enter his van in College Road, Margate, at about 10.40am on January 6 this year, leaving him with injuries so serious he now struggles to walk. As the 59-year-old postman lay on the road with a serious head injury, fractured eye socket, a broken leg and shattered kneecap, Fogarty drove off - only to be followed by another motorist who beckoned her to stop by flashing and beeping. She argued she was turning around to come back, but CCTV footage showed her car travelling twice around a roundabout. Prosecutor Neil Sweeney said Fogarty claimed she realised she had "clipped something but did not realise it was a man" and did intend to go back to "see what she had hit". Speaking to the court's probation team just hours before the sentencing, she said she thought the case had been "blown out of proportion" and "an accident had been turned into a criminal case". Because she failed to turn up to her trial, magistrates issued a warrant for her arrest and she was later hit with an additional charge of failing to surrender to court. She had already been found guilty of failing to provide a breath specimen for analysis and failing to stop after a road accident. A charge of driving while unfit through drink was dropped due to a lack of evidence. Fogarty told probation officers she had stopped drinking at about 12.30am that day, having also taken a Diazepam tablet and sleeping pill. A probation officer said: "She said she does not drink regularly but does at special occasions, and had smoked cannabis at Christmas. "That night, she said she drank two glasses of wine and had two gin and tonics. "She also said she did not fail to stop at the scene and was looking for a safe place to turn around. "But I find this questionable considering the distance travelled and feel multiple places to turn around seem to have been disregarded. "She refuses to accept that she failed to stop. "I don't think she accepts full responsibility and does not understand what it is to be remorseful. There is a lot of work to be done." Patrick Cuffe, Fogarty's solicitor, said that although she had driven away from the scene initially, she had returned before police arrived. He added: "She admitted straight away that she was the driver, too." Mr Marsh, from Birchington, spent 29 years delivering letters and parcels, but was forced to give up his job and now struggles to even walk without an aid. Having been airlifted to London in a critical condition after being struck by Fogarty's vehicle, he spent weeks in hospital recovering from his devastating injuries. Chairman of the bench Glynn-Williams said Fogarty had "clear attitude issues". Sentencing her, he added: "This accident in general has conceded in dreadful consequences for Mr Marsh, who has been left with life-changing injuries. "You don't seem to have taken responsibility for the accident." 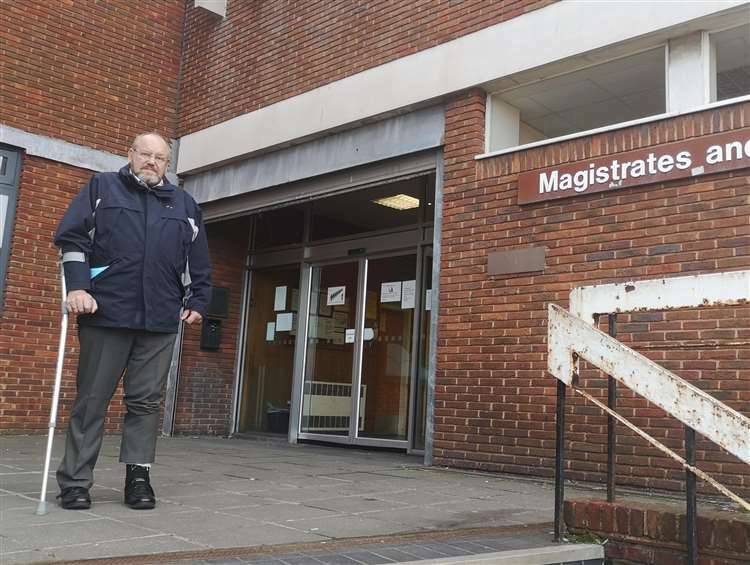 Fogarty, of Millmead Road in Margate, was given a 24-week prison sentence, but the term was suspended for two years. She was also banned from driving for three years, ordered to carry out 300 hours of unpaid work and hit with £600 costs. She clutched a black scarf to her face as she left court following sentencing on Tuesday. Speaking afterwards, Mr Marsh, who has a one-year-old granddaughter, says he now wants to start rebuilding his life. "I am very pleased with the outcome and happy the magistrates took no nonsense from her as well." he said. "What happened to me was a shock and a change in my life I was not prepared for. "I have had to give up work, my garden has gone to rack and ruin and I struggle to walk far. "But I have a lot of friends who rally around and help me, and my son takes me places. "I am also very thankful to the air ambulance service and King's College hospital. I am lucky to be alive. "I am hoping the condition of my legs will improve but that could take any amount of time - it could be months; years, even. "I am just glad the hearings are over now and I can put it behind me and move on and focus on my legs." if that had been a man, he would have been jailed!!! what more did she have to do, to serve time, kill him??? This is the same Sheree Fogarty/Mcnamee who's brother died when the cocaine packets he was smuggling out of Peru in his gut started leaking?